How Often Should Black Women Trim Their Hair? African American hair comes in many textures and its growth pattern varies from other races. African American hair coils at the root and thus appears shorter in length than it actually is. African American hair also typically grows slower than that of other races. Many African American women may wonder when they should trim their hair. Every hair type is different, and trimming schedule varies by the condition of the hair. With a guide of what each type of hair needs, trimming schedules are made easier. Healthy hair should have a steady appointment to be trimmed at half an inch every six to eight weeks. Healthy hair will have no damage or breakage if regular trimming and conditioning occur. 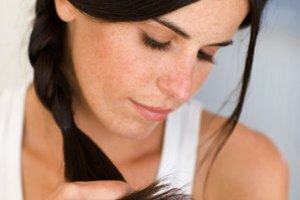 It is fine to wait longer than eight weeks for a trim, but it is important to watch for split ends. Chemically processed hair should be trimmed every four to six weeks to stay healthy. When hair is chemically processed, the damage lingers on the ends. When new growth comes in, you should take half an inch off. It is not recommended to wait longer than six weeks, as damage progresses the longer hair is left untrimmed.